Lakeshore Foundation has a long history of promoting the Olympic and Paralympic Movement. 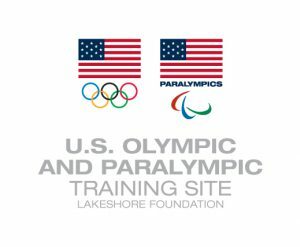 In 2003, Lakeshore earned the designation as an official United States Olympic Committee (USOC) Olympic and Paralympic Training Site which hosts national team training camps and international competitions. Since this designation, Lakeshore has produced 52 Paralympic athletes, coaches and staff, and those athletes have captured 30 Paralympic medals. In addition, Lakeshore is the High Performance Management Organization (HPMO) of USA Wheelchair Rugby. Local Birmingham athletes like three-time Paralympian (Para athletics) Josh Roberts and five-time Paralympic medalist (Para cycling) Jennifer Schuble also train at Lakeshore to reach their Paralympic goals. The Paralympic Games is the world’s second largest multi-sport event right behind the Olympic Games. It features the world’s top athletes with a disability or impairment. In fact, the word “Paralympic” derives from the Greek preposition “para” (beside or alongside) and the word “Olympic” to illustrate how the two movements exist side-by-side. Twenty-eight sports are offered at the Winter and Summer Games, which are governed by the International Paralympic Committee (IPC). While the name of the sports may differ by country, the IPC calls all of the sports, whether competed at an introductory or Paralympic level, Para sports. All athletes who participate in Para sport are Para athletes, and once an athlete competes in a Paralympic Games then they are considered a Paralympic athlete. Lakeshore is celebrating its 15th year as an Olympic and Paralympic Training Site. We are honored to continue the tradition of working with the United States Olympic Committee (USOC), training athletes as they strive for the top of the podium. Do you have Olympic and Paralympic goals? For more information, email Meagan Rowe or call 205-313-7459. At the PyeongChang 2018 Paralympic Games Team USA brought home 36 medals, the most of any nation, and had its best showing at the Winter Paralympics in 16 years. Team USA also lead every country in claiming gold medals on each day of the Games, surpassing its previous 1992 gold medal count. The Para Nordic skiing team had its best performance to date, winning 16 medals. Para snowboard won 13 medals at the Games, including seven medals in banked slalom which made its Paralympic debut in PyeongChang. U.S. Para ice hockey became the first team to win three consecutive Paralympic titles. The team beat Canada in an exciting overtime win to take home the gold. At the Rio 2016 Paralympic Games Team USA had its most successful performance since Atlanta 1996, bringing home 115 medals. Lakeshore played a large role in Team USA’s success with all of our training site teams earning medals. The U.S. Men’s and Women’s Wheelchair Basketball Teams captured gold, capping off a U.S. gold-medal sweep of all Olympic and and Paralympic basketball events. The USA Wheelchair Rugby Team finished its Paralympics with a heart-breaking, one-point overtime loss to Australia in the gold medal match. Despite their disappointment, the team finished with a highly coveted silver medal and improved upon their bronze medal performance in London 2012. The U.S. Women’s Goalball Team had its most successful Games since 2008, defeating host nation Brazil in the bronze medal match and claiming a podium spot.